Non-medicinal ingredients: microcrystalline cellulose, sodium stearyl fumarate, xylitol, hyprolose. 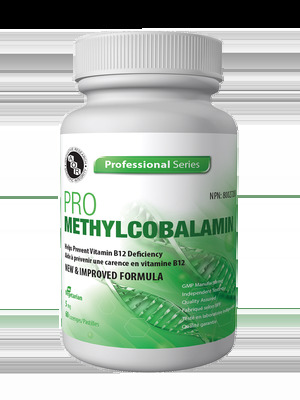 Methylcobalamin is used to help prevent B12 deficiency and pernicious anemia. Additionally, it is helpful for many neurological disorders as B12 deficiency is associated with cognitive decline. It can also reduce pain in people with degenerative spinal conditions, improve nerve function in unaffected limbs of stroke patients, and normalize the circadian rhythm to improve sleep and mental function. Methylcobalamin supplementation also benefits patients with hyperhomocystemia. Pro Methycobalamin is a high-dose formulation individuals at risk of deficiency, who would benefit from supplementation at higher levels. Adult Dosage: Dissolve 1 lozenge under the tongue first thing in the morning with/without food. Caution: Reassess for use beyond 4 months.